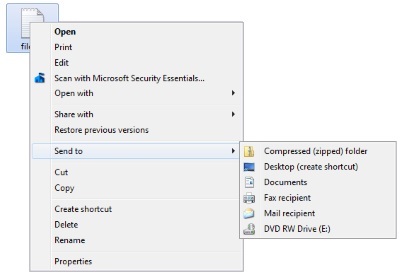 With the Windows Operating System there are several ways to open a file in an application, for example drag-and-drop. But drag-and-drop requires the destination application icon to be visible on the desktop. Another method is the Send to menu. When you right-click on a file's name or icon, in the popup menu that appears, you can select Send to. You can select to send that file to any target listed in the Send to menu. But what if your desired destination is not in the Send to menu? Also having to search through a large menu of items that you never use slows down productivity. The Send to menu is actually a refection of shortcuts in a folder on your hard disk. Unfortunately that folder is buried deep at the location shown below. C being the disk containing youe operating system. To add items to the Send to menu, place a shortcut to that application, or folder, in the SendTo folder. To remove an item from the Send to menu, delete its shortcut from the SendTo folder.